Fiat commissioned a print advertising campaign to promote their achievement as the the lowest CO2 emmision car range in Europe. 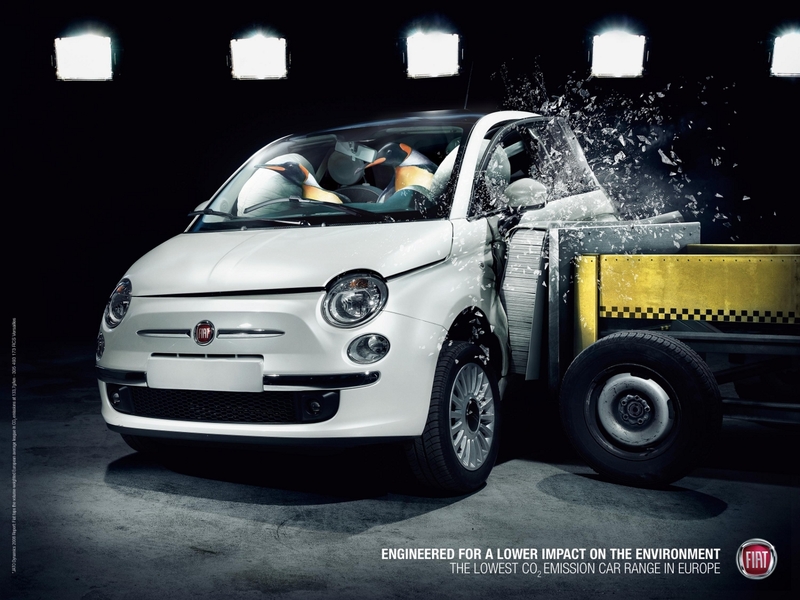 A crash test Panda, Walrus and Penguins demonstrate that the Fiat range is engineered for a lower impact on the environment. A crash test Panda puts a car through its paces to the sounds of Queens’ track, Save Me. 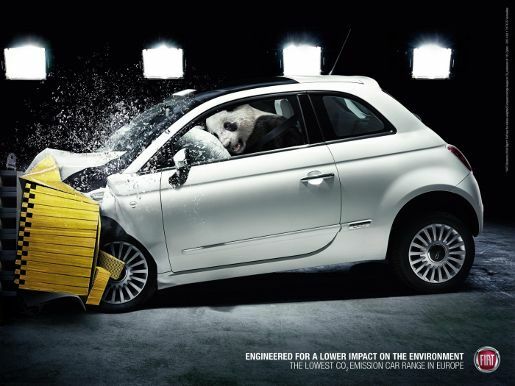 The Endangered Animals campaign was developed at Marcel Paris, France, by chief creative officers Frederic Temin and Anne De Maupeou, copywriter Eric Jannon, advertiser’s supervisors Olivier François, Arnaud Belloni, Maurizio Spagnulo, art buyer Jean-Eric Le Coniac, art director Dimitri Guerassimov, photographers Ebo Fraterman and Roman Schwienbacher. Digital work was done at Le Moulin De Docs. Filming was shot by director/animator Rémi Devouassoud via Wizz, Clichy, and WAM, Paris, with producers François Brun and Pierre Marcus. Sound was designed at WAM Son. Post production was done by Cédric Herbet and Eric Alcuvilla. 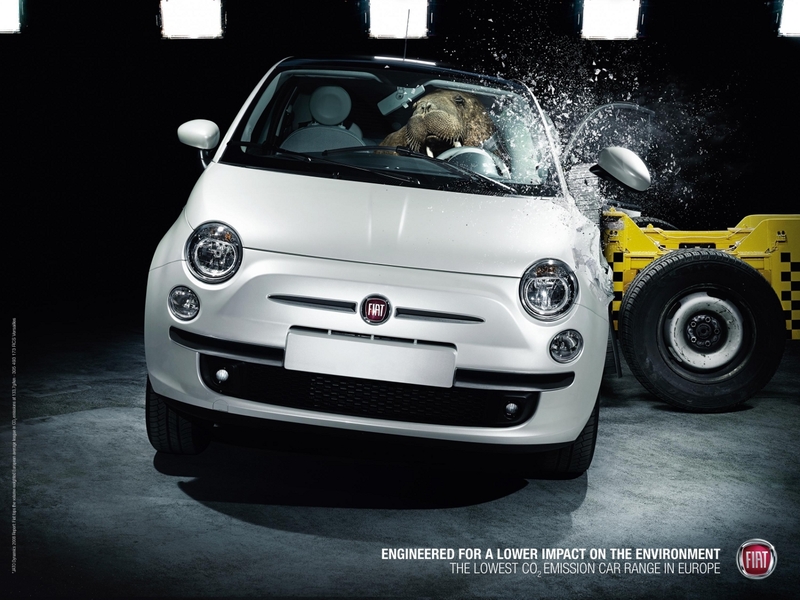 Fiat’s claim to fame comes from the JATO 2008 report. Fiat is at the top of the ranking (133.7 g/km) for and is followed by Peugeot (138.1 g/km), Citroën (142.4 g/km), Renault (142.7 g/km), Toyota (144.9 g/km), Ford (147.8 g/km), Opel/Vauxhall (151.1 g/km), Volkswagen (158.8 g/km), BMW (160.6 g/km) and Mercedes (185.0 g/km).